EDUCATION: He signed his will. His inventory included "books" valued at 10s. OFFICES: Grand jury, 7 June 1645, 4 June 1650, 2 October 1650, 7 June 1653, 3 June 1657 (refused to serve) [ PCR 2:84, 155, 162-63, 3:32, 115]. Petit jury, 7 March 1636, 2 October 1637, 2 January 1637/8, 4 June 1639, 3 September 1639, 7 July 1646, 6-7 June 1649, 29 October 1649, 10 June 1650, 7 October 1651, 4 June 1652, 5 March 1655/6, 5 October 1656 [ PCR 2:140, 160, 7:5, 7, 12, 13, 42, 46, 56, 60, 77, 81]. Duxbury highway surveyor, 3 June 1656, 3 June 1668 [ PCR 3:100, 4:181]. ESTATE: In the Plymouth tax list of 25 March 1633 assessed 9s., and in the list of 27 March 1634 18s. [ PCR 1:11, 28]. On 27 July 1640 William Renolds acknowledged the sale to Henry Howland of Duxbury of five acres of upland in Duxbury and one acre of marsh meadow lying at the east end thereof, with all rights [ PCR 12:60-61]. On 6 June 1650 Henry Howland granted to Experience Mitchell and his heirs access to a spring on the border of his property [ MD 1:97-98, citing PCLR 2:1:9]. In his will, dated 28 November 1670 and proved 8 March 1670/1, Henry Howland bequeathed "all my housing both dwelling house and barn, with all my lands both upland and meadow ... within the township of Duxburrow ... unto my son Joseph Howland only during my wife's life she shall have and enjoy the new room to herself for her own use"; to "my son Joseph Howland four oxen and two heifers and one horse with all the tackling ... also a bed with things belonging thereunto, as also my fowling piece"; "my son Joseph Howland out of the forementioned houses and lands and cattle shall pay or cause to be paid unto my son Zoeth Howland £20 ... as also 12d. apiece to all his brothers and sisters and their children now surviving"; to "my daughter Sarah two heifers and two steers and one mare now running at Ponaganset, as also one bed and bedding thereunto belonging"; to "my son John one musket"; to "my daughter Elizabeth one cow"; "my old mare now running at Ponagansett unto my son Samuell Howland"; to "my son Joseph Howland two acres of meadowland ... at ... Gurnett's Nose marsh"; to "my daughter Mary 10s. "; to "my daughter Abigaill 10s. to be paid by my son Joseph who is to sell a barrel of cider and to pay it out of that"; to "my two sons John and Samuell each of them a barrel of cider"; to "my loving wife Mary Howland" residue [ MD 19:32-33, citing PCPR 3:1:26]. The inventory of Henry Howland of Duxbury was taken 14 January 1670/1 and totalled £141 4s., with no real estate included [ MD 19:33, citing PCPR 3:1:27]. In her will, dated 8 May 1674 and proved first 26 April 1674 and second 8 April 1675, Mary Howland "sometimes the wife of Hennery Howland now deceased" bequeathed to "my daughter Abigaill Young" £1; to "my son Zoeth Howland" £1; to "my son John Howland my house at Ponagansett"; to "my daughter Mary Cudworth" £1; to "my son Samuel Howland" £1; to "my daughter Sarah Denis" £1; to "my daughter Elizabeth Allin" £1; and to "my son Joseph Howland" the residue [ PCPR 3:2:10]. 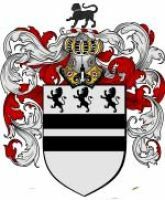 BIRTH: Probably Fenstanton, Huntingdonshire, by about 1603 (based on estimated date of marriage), son of Henry Howland [ TAG 14:214-15]. DEATH: Duxbury 1 January 1670/1 [ NGSQ 75:113, endnote 3]. i ABIGAIL, b. say 1628; m. Plymouth 13 December 1648 John Young [ PCR 8:5]. iii SAMUEL, b. about 1638 (described as "near 70 years old" in 8 July 1707 [ NGSQ 75:112, citing Bristol County Court of General Sessions 1702-1714:121]); m. by about 1673 Mary Sampson, daughter of Abraham Sampson (eldest child b. about 1673 [ NGSQ 75:112]) [ TAG 15:165-67]. v MARY, b. say 1643; m. by 1665 James Cudworth (eldest child b. Scituate 3 June 1665 [ NGSQ 75:110, citing records of Pembroke Monthly Meeting). vi SARAH, b. about 1645 (d. Portsmouth 2 October 1712, aged about sixty-seven years [ NGSQ 75:216]); m. Portsmouth, Rhode Island, 19 November 1672 Robert Dennis [ NGSQ 75:216]. vii ELIZABETH, b. say 1647; m. by about 1669 Jedidiah Allen (eldest child b. 30 August 1669 or 1670 [ NGSQ 75:111, citing Sandwich Monthly Meeting]). viii JOSEPH, b. say 1649 (evidently not a minor when his father wrote his will); m. Hampton 4 May 1683 Rebecca Hussey [ NGSQ 75:217, citing Salem Monthly Meeting 3:1]. ASSOCIATIONS: Brother of JOHN HOWLAND and Arthur Howland. COMMENTS: On 22 December 1657 Henry Howland, for entertaining Quaker meetings at his house, was summoned to appear at the next court [ PCR 3:126]. On 2 March 1657/8 he was fined 10s. for entertaining a meeting at his house contrary to the order of the court [ PCR 3:129]. On 7 June 1659 "Henry Howland of Duxburrow" as a Quaker "or manifest encourager of such" is on a list to lose freemanship and is ordered to appear in August to be convicted and censured [ PCR 3:167]. At court 6 October 1659 Henry Howland was disenfranchised for being an "abettor and entertainer of Quakers" [ PCR 3:176]. On 1 May 1660 he was accused of entertaining another man's wife in his house after complaint was made to him by the husband, and for permitting a Quaker meeting in his house, and for entertaining a foreign Quaker contrary to the order of the court. The first charge he "stiffly denied" but he was convicted of the other two and fined [ PCR 3:186]. He was twice fined on 2 October 1660 for entertaining Quaker meetings [ PCR 3:201]. We differ slightly from Wakefield and Sherman [ NGSQ 75:107] in the birth sequence and estimate of birth dates for the children of Henry Howland. The assumption has been made that all the sons were of age when the father made his will, but this makes some of them older than the norm when they marry. Even this arrangement leaves an apparent gap of about seven years between the first two children (Abigail and Zoeth) and the remaining six. These first two children may well have been born in England, and there is the possibility that they were by an e arlier wife and not by Mary. BIBLIOGRAPHIC NOTE: The parentage and parish of origin of the three Howland brothers was reported in 1938 by Clarence A. Torrey [ TAG 14:214-15]. A definitive article on what is known to date about Henry Howland was published in 1987 by Robert S. Wakefield and Robert M. Sherman [ NGSQ 75:105-16, 216-225].